ALDE - Act now for her future, commit to gender equality? 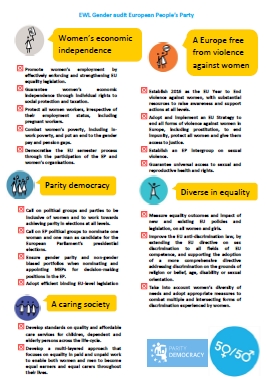 ALDE’s top candidate, Guy Verhofstadt, endorsed the demands of the EWL manifesto and thereby committed to women’s rights and gender equality in general, as well as to our specific demands. The ALDE manifesto, however, does unfortunately not go beyond the term of human rights and discrimination in a very general sense. Women and women’s rights, as well as gender equality are not mentioned once. The EWL agrees that human rights in Europe and beyond are a very important issue. But we would like to remind the Alliance of Liberals and Democrats for Europe that women make up 50% of all human beings still facing various forms of discrimination and inequality. Even though their top candidate endorsed our manifesto, the parties’ manifesto does not consider gender equality and women’s rights as an important field of action. It is however crucial to address the special needs and situations of women, as well as to monitor current existing strategies and laws inside the EU, in order to improve these. As to make individual freedom a reality, women need to enjoy the same rights as men, not only formally, but substantially. Women’s employment needs therefore to be promoted, gender pay and pension gaps to be closed, parity in decision-making positions to be reached and efficient legislation guaranteeing these rights needs to be adopted. The funding of policies with this aim needs to be guaranteed, even more in times of crisis and budget cuts, hitting for the most women. To reach the goal of a Europe of tolerance and equality, the Alliance of Liberals and Democrats is more than welcome to support us in these demands. How does ALDE’s manifesto compare to the EWL’s demands?